Are there scientists as well? Yes. It is important to integrate scientists and technicians to this work. They could then cooperate with the Air Force of many countries. The object of our study is something which is in the sky. In Uruguay, though, it had not been harmful to humans. However, it is still there affecting our air space. That is the reason why the Air Force is interested in investigating the subject at technical and scientific levels, not to mention the military and strategic view. This is the work of our Committee. Speaking as a civilian what is your personal opinion about the nature of these objects? It is difficult to forget my military background and give a civilian opinion. In fact every opinion I express I do it as a military because people will always see me as one. I try to be objective without killing or supporting any idea that could be on the UFO phenomenon. I think some of the cases we have investigated might have a scientific explanation, but I don’t know what explanation would it be. There are many possibilities and I work with evidence, because I think as an investigator. In order to do something in this field one must have evidence on the table and I have analyzed them tirelessly. If we talk about my convictions we would be talking about beliefs or something more spiritual. I prefer scientific evidence of UFOs, because this is what can convince me and everyone else. UFOs should not be a matter of faith or something one wants it to be. Do you believe in more advanced life in planets out of our solar system? Yes. I believe in intelligent life in other planetary systems. There must be other forms of life in the universe such as other organisms, cells, or whatever else. To some extent, it has already been proven that Mars had some form of life. Even water was found there. It seems water was found in the Moon as well, below the surface crust. Wouldn’t those species out there be wondering about intelligent life in other planets as well? You have described interesting cases. Can you tell us how Cridovni’s chain of investigation works from the initial report until the investigation findings? Well, once we receive a phone call at the Air Force our standard procedure is put in place. It means we would assign an investigation team from our Committee to go and talk to witness and hopefully collect some evidence. This group is normally made of two or three people. They would get to the place and talk to people who could give them pictures, videos, etc. Then we scan the area to sketch trees, mountains, rivers, power lines, airports nearby, etc. We would also make pictures and talk with witnesses’ neighbors. That summarizes a typical UFO investigation. Exactly. It is a police style investigation. We talk to witnesses, but we would also ask their neighbors if they had seen anything strange that would confirm the first story. Many times more information can be acquired from other witnesses. In case of landings, do you collect samples? Yes. In case there is any signal of a landing we would collect samples in order to check for mineral or chemical composition. After collecting all information and evidence available we would send to the national Department of Mineralogy and Geography samples which could be analyzed by a lab. They would make the analysis and call us back for the results. What would be Cridovni’s next step in this case? After collecting all these information we take them to our Technical Department for assessment. Our work is very well assigned. For example, an initial survey team would make the first collection of information and evidence then submit them for analysis. Results from this would be taken care of by our Technical Department, who assesses the investigation and could ask for new interviews with witnesses. There might be the need for different questions the Operative Department did not make. Therefore, we have the chance to get back to witnesses and collect new evidence which maybe we didn’t collect in the first time. What are the duties of Cridovni’s Operative Department? The team also looks for the circumstances in which the sighting took place in an aeronautical point of view. We look for data on military or civilian aircraft that might have been passing over the area at the time, movement of satellites, information on astronomical facts, meteorology, geology, etc. We also research for military maneuvers in the area — which have already been found in two of our cases — that might have led people to consider a UFO hypothesis. We try to raise all possible information that could support an investigation. How long does an average investigation take from the first interview with witnesses until conclusion? It could take a week in general. It depends on the facts. When there are physical evidence with samples to be analyzed, the lab might take a few days to return to us with the results. When we have photo evidence, then the technicians might take a few more days to issue a report. Sometimes it takes long because we don’t have staff exclusively dedicated to this work. We use the resources provided by the state of Uruguay, the Air Force and partner universities. As for image analysis we are lucky to have a team in Boiso Lanza air base which works with aerial photography. When we need their services, we just send them the pictures. Cridovni seems to be very thorough in its different stages of investigation and confirmation of facts. Yes. I think the conclusion of an investigation could take a week to 10 days. For example, when Uruguayan national football team arrived in Montevideo coming from the World Cup a lot of unusual images appeared in the sky in pictures taken during celebrations. This investigation took us almost two weeks because more and more pictures appeared as the news spread through the media. The Committee was overloaded with e-mails. We received more than 60 pictures not only related to that event, but also from other places or times. We needed almost two weeks to analyze everything. And what was that all about? Regarding the pictures taken during the mass celebration we found that they showed a known object.It could have been a paper or nylon balloon. So many balloons were launched in the sky that time and people were confused when they spotted something different in their digital pictures. There were no direct witness testimonies on this fact, only pictures. Getting back to Cridovni’s investigation methods, could you please describe each step of its procedures? Can it be a hoax prepared by the witness? Can it be a hoax prepared by third parties? Can it be a collective hallucination? Can it be a conventional event not identifiable by the witness? Can it be something unconventional? The very last are the most interesting ones. However, only after every possibility is checked we can start our analysis on witnesses and evidence. Among other resources, we have psychologistsin order to make a profile of witnesses. We also have astronomers, engineers, pilots, flight controllers, meteorologists, etc. As I said, we are very rich in human resources specialized in different fields of expertise so that we can assess each and every case. Then, all the documents produced go to the Technical Department. You said a team of two or three people is assigned to go to the field and meet the witnesses. How are they selected? Do they wear military uniforms? They wear uniforms, sometimes they even go on military vehicles. It depends on the situation. For example, someone could call me at 10h00 PM and I have to rush to the scene. Then I would call an officer or even a civilian from our Committee to join me in that mission. This would be a team of two or three people, depending on the urgency of the matter and the availability of personnel at that moment. It is important to say that we are called at any time and we must be ready. I am the one who decides who goes to the field. I can appoint and official or a civilian from the Committee or I can go myself to the mission. How many civilian ufologists does Cridovni have? What are their duties? There are many veteran investigators. Some come from Uruguayan research groups and were invited to take part in our group when it was created. In the 1970s there were half a dozen civilian organizations working with Ufology in Uruguay. When the Air Force created the Committee in 1979 all of them were invited to participate in a joint investigation work. That is wonderful! This is exactly what we are trying to reach with the Brazilian Air Force (FAB) by means of our campaign “UFOs: Freedom of Information Now”. Thank you. Therefore, around 30 civilians entered and still remained in the Committee. That group was later reduced to around 20 researchers and today we are something between 12 to 18 civilian and military altogether. How many among these are civilians and how many are military? At the moment we are only three military — a lieutenant, a lieutenant-colonel, and a colonel who is the chair of the Committee, this is me. I have two other officials scheduled to work which will make us five military on duty. Then we have eight civilian researchers making a total of 12 permanent members. Besides these ones we have occasional members, assistants who participate depending on the case. If we need a photo analysis, for example, we rely not only on the Air Force analysts we borrow. We have also an engineer specialized in image analysis who would also participate in the investigations. The Committee’s permanent staff is made of 12 people: five military officials and seven civilians. What is done when an investigation finds out that an object is not a conventional thing? When conclusions point to an unconventional matter, then the case is archived and remains pending, because there is nothing else we could do about it — unless new information appear to tell that, in fact, it was a conventional phenomenon. Aren’t these the most interesting ones? Why are they archived then? I can give you an example. Suppose a black triangular-shaped object is spotted and captured in pictures by a military crew who managed to chase and reach it. Up to this point it is an unconventional case. However, imagine that we have later information that it was an experimental aircraft from a friendly air force who would be, let’s say, lost in that region due to communication problems. Such kind of information might reach us many years later and will force us to reopen a case in order to give it an explanation. That is why we keep archived cases as pending and waiting for information we do not have at the time of their investigation. In case of a significant unconventional occurrence who do you report to? The Air Force commander, the president of the Republic, any other national body? In this case we would always inform the Air Force commander, because our Committee is under him. So I must report him anything involving the Air Force, such as an unconventional occurrence, for example. After that, the information is relayed to the minister of Defense and the president of the Republic. In case it is a very important occurrence, the president will decide on what to do. Do you have any idea about how this information is dealt with or do you only report them as a matter of duty? We report to the president so that he is aware of what goes on within our territory which is his jurisdiction. There is a very interesting case which could answer to your question. In 2007 we received a report from a Lufthansa aircraft whose route was Buenos Aires-Europe through Uruguayan and Brazilian airspace. When flying over the River Plate the pilots spotted an object going upwards in very high speed and close to their aircraft. It missed the cabin by meters. This case came to the knowledge of the president. Would you please tell us more about this case? This is a very interesting case and involved our diplomacy in an unprecedented way. We received a report from the Lufthansa aircraft which was going from Buenos Aires to Europe. They should fly over Uruguayan and Brazilian territories. When they were over the River Plate, which is the border between the two countries, the pilots spotted an object going upwards, very close to their cabin and in very high speed. It missed the cabin by meters only. The fact was registered as an air incident and the crew immediately contacted the traffic control at Ezeiza airport, in Buenos Aires, to report that an object had crossed its route. The pilots thought it could be a missile and, of course, the fact was reported since it threatened their flight safety. Another aircraft — a Uruguayan this time — also spotted the same object while flying over the River Plate. The crew described a low altitude flying object which suddenly went up crossing between both aircraft, but closer to the Lufthansa. The crew of both aircraft describe the same scene: a very fast artifact, though only the German crew thought about a missile. Our Committee immediately started an investigation. As it was an important case — which quickly spread through the media and included around 20 witnesses on the ground — we acted swiftly. What did witnesses on the ground report? Did they see the same the crew saw? Yes. The fact occurred at around 04h00 when many people in rural areas were starting their daily work in the field. Those people saw an object in Colonia del Sacramento (a city neighboring the River Plate, 150km West of Montevideo, far away from Buenos Aires) and other regions of Uruguay and Argentina. All of them report seeing the same thing, as if a projectile had crossed between the aircraft. The crew had at least four professionals: the pilots and the flight engineers in the Lufthansa and the Uruguayan aircraft. This is, therefore, a highly credible case and calls for a thorough investigation. No doubt about that, especially with likely radar readings and ground witnesses. What happened then? Where does the president fit in this whole story? When we started investigating we had to go to Colonia in order to talk to witnesses. At the time I was a lieutenant-colonel and directly participated in the procedures. We received Lufthansa’s report through the official channels, that is, the Uruguayan Ministry of Foreign Affairs. They reported the threat to that flight’s safety and the pilots’ description of what they had seen. However, when Lufthansa’s report reached our government the investigation had already on. What procedures were put in place? One measure was consulting the Argentinian government, because someone spoke of a missile and we didn’t have any reason to doubt that possibility or the possibility of a high performance aircraft. Four land engineers confirmed having seen from their car an object at the horizon. The object then went up. The engineers also said to have seen something like a light explosion which ran upwards faster than the object itself. That was what made us think of a missile in its second phase. There are projectiles which work though different phases. It could have been something fired from a submarine at the River Plate. Do you remember that case at the Canary Islands which was found to be a missile launched from a submarine? That case is a classical example. So you mean the suspicion of a submarine between Uruguay and Argentina would be the reason for the involvement of diplomatic offices? Was that the reason why you informed the president of the Republic? Exactly. Although we still didn’t have any confirmation about the missile, we informed the president. In the end, the case was found to be an unconventional event, because we didn’t know if that was a high performance aircraft or anything else. We could not discard the missile hypothesis which we couldn’t confirm that time either. Therefore, the case remained open. What did the president do when informed on the facts? The chain of command was initiated. We sent the report to the Air Force commander, who forwarded it to the minister of Defense, who, in turn, informed the president. The Committee has no direct access to the minister or the president. We don’t know what they did with this information. However, the case went public. It was in every media in Uruguay or Argentina. There was a great commotion. How does Cridovni act in cases involving another country? An event like this which involved a neighboring country is a very serious issue. 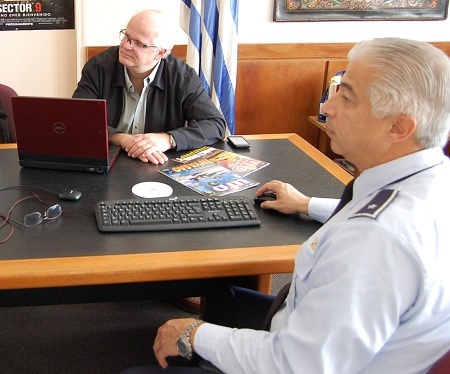 We relayed the information we had to the Argentinian Air Force (FAA) and I spoke in person with their public relations officer. He immediately dismissed the possibility of that being a missile or a secret aircraft of their own. So we had to inform the minister of Defense as well. The minister made our investigation public by means of a press release (available online). It mentions an air incident, not a UFO case.